The first black Archbishop in the Church of England took up his post with a warning that "expectation lay heavy on his shoulders". Dr John Sentamu was confirmed as the 97th Archbishop of York in a ceremony at St Mary-le-Bow church in the City of London on Thursday evening. 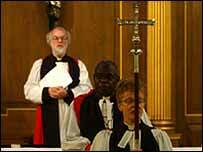 The Archbishop of Canterbury Dr Rowan Williams told him people expected he would engage with the big issues. He will not take up his work until his enthronement in York on 30 November. Dr Williams, who led the service with six senior bishops, said the people of the York diocese would be looking for someone who was a faithful teacher of the faith, and someone who would speak for the whole of the north. After the service Dr Williams explained what he meant by the burdens faced by the new Archbishop. "John has the power of persuading us in the Church of England that change really is possible," he said. "We all of us are committed to that but we need people whose experience... demonstrates that this can be done, that it is possible to enthuse people of all kinds and from all backgrounds, ethnic communities, or ages with the vision of the Kingdom. "That's what we're hoping for." The hour-long ceremony, which has its basis in the 4th century, combined the modern and medieval. The service began with a performance by a group who normally lead services at a community church in Huddersfield, West Yorkshire. Andrew Kisumba, accompanied by the group, was handpicked by Dr Sentamu to perform his song, Your love Lifts Me Up. Guests were encouraged to participate in the rendition.